Gore Mountain Ski And Stay Packages in North Creek NY at The Alpine Lodge! Our Gore Mountain Ski packages include your choice of midweek, weekend, spring getaway and mid-winter specials. 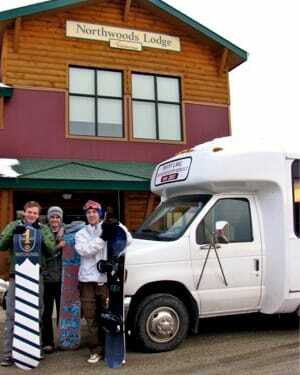 Our lodging in North Creek NY is near the very best skiing, snowboarding, and showshoeing in the Adirondacks and surrounding regions of the Northeast. Gore Mountain Ski Center is just minutes from our door, and our Adirondack motel accommodations provide the perfect setting for your après ski relaxation! For your convenience, there is a free continuous shuttle from our doorstep to Gore Mountain and the Ski Bowl on weekends and holidays. The Alpine Lodge is located near all the winter sporting adventure you can handle! Picture yourself at the summit of the towering Adirondack Mountains where the air is crisp and the views are endless. After a day of skiing or snowboarding, our cozy accommodations offers a comfortable retreat, complete with a crackling fire in our cozy Great Room. Bring the group – when it comes to family lodges, Alpine Lodge has the most to offer! Just minutes from the door of our motel is Gore Mountain, while a short drive brings you to West Mountain in nearby Glens Falls, to Oak Mountain in Speculator, or north to Whiteface Mountain in Lake Placid. If you prefer Nordic cross-country skiing or snowshoeing, all you have to do is step outside! Alpine Lodge is set amid a beautiful wilderness backdrop, making it an ideal spot for journeying through the snow on skis or snowshoes. Plan a winter weekend getaway or a full-fledged Adirondack family vacation at our cozy North Creek NY lodge. Contact us or call (518) 251-2451 for more information about our Gore Mountain ski packages. We hope to see you soon! Valid any non-holiday Sunday night-Thursday night for ski Monday-Friday ski days. The longer you ski and stay- the less you pay! Based on a standard king or standard double/twin room. On these dates get a 3rd night and a 3rd day of skiing FREE at the rates above! First day of skiing must be on Friday or Saturday. Avail Dec 25-Jan 1, Jan 13-15*, Feb 17-25. * Includes Coca-Cola fireworks spectacular for Martin Luther King Weekend only. Spend a winter weekend in the Adirondacks! Choose to cross-country ski or snowshoe at Garnet Hill XC Ski Center or snowshoe at Natural Stone Bridges and Caves. $15 gift certificate to choose a bottle of wine at barVino wine cellar to enjoy in your room. Keepsake Alpine Lodge water bottles. Two one-day tickets to the venue of your choice. Complimentary continental breakfast each morning in The Great Room. For more information about our Gore Mountain ski packages, or reservations at our Adirondack motel lodging near Gore Mountain, call (518) 251-2451, contact us online, or check for availability and reserve your room today.